Qualcomm’s officially launched its latest Snapdragon 835 processor which features major improvements all around. The SoC is set to be spotted in various commercial devices beginning from the first half of 2017. Qualcomm’s partnered up with Samsung to produce the Snapdragon 835. The chipset will take advantage of the latter’s 10nm FinFET process technology. The South Korean brand was the first to enter mass production of 10nm FinFET back in October this year. 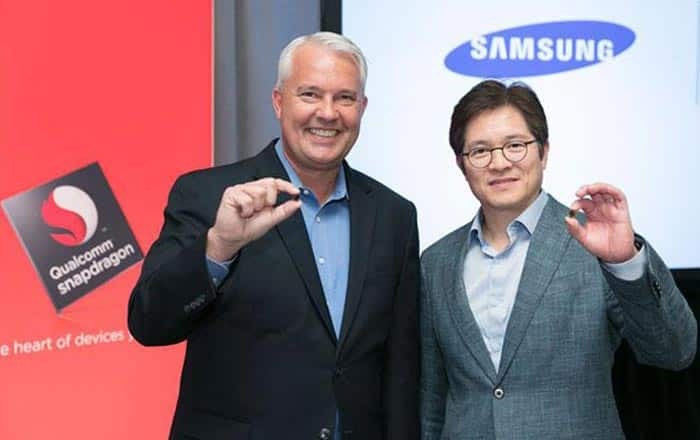 Compared against the previous 14nm FinFET technology utilized by the likes of the Snapdragon 821, the new 10nm FinFET makes way for 40% lower power consumption, 30% rise in area efficiency, and 27% higher performance. As a result of these advancements, Qualcomm claims the Snapdragon 835 chip will have a smaller footprint. This translates to handset makers having more usable space to insert larger batteries or incorporate slimmer designs. Qualcomm also asserts that process improvements combined with an upgraded design will bring about major upticks in battery life. Speaking of batteries, Qualcomm has also unveiled its Quick Charge 4 fast charging technology and confirmed that it’ll be present in the Snapdragon 835 SoC. The brand promises it can extend smartphone use by 5 or more hours after just 5 minutes of powering up. It also apparently delivers up to 50% charge within 15 minutes. Qualcomm says its Dual Charge technology makes sure fuel is supplied up to 20% faster and 30% more efficiently as compared to the previous standard. Quick Charge 4 further integrates both USB Type-C and USB-PD support, effectively throwing its doors open to a wider variety of cables and adapters.